Can we pretend like lemon bars are a breakfast food? I mean, Naomi's gorgeous picture makes them look dreamy enough, so lets just pretend for a second that lemon bars are good for you. It is good to have a lot of vitamin C in the winter and lemons have a lot of vitamin C, so that counts right? It is probably a good thing I don't have any lemons in the house. 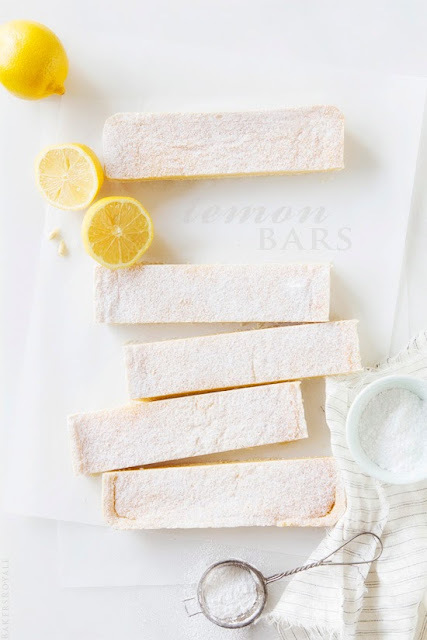 You can get the recipe for these beautiful lemon bars over at Bakers Royale. She uses Ina Garten's recipe, and I have never tried anything of Ina's that I didn't love. And it seems lemon bars are in the air because Joy the Baker is sharing her lemon bar recipe today too. This may require a double batch to compare and contrast, purely for scientific reasons, of course. Oh, how I love a lemon bar! I think it is safe to say this is a breakfast, lunch, or dinner food, necessary to remind you that spring is on it's way!